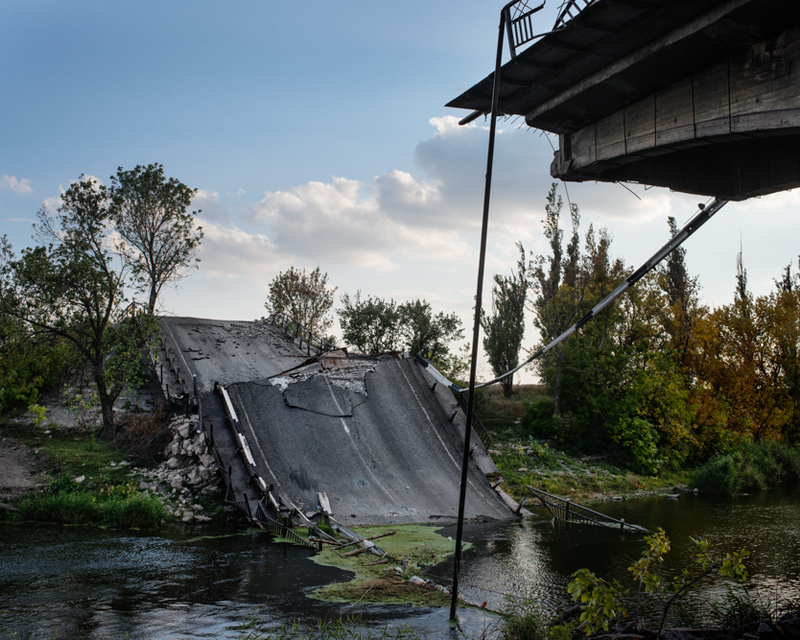 Maïdan to Donbass tells of the events that shook the Ukraine from the end of 2013(…).Guillaume Herbaut made a dozen or so trips for various French newspapers, ranging from Paris Match to Figaro Magazine, as well as Le Monde, Télérama, and Libération. 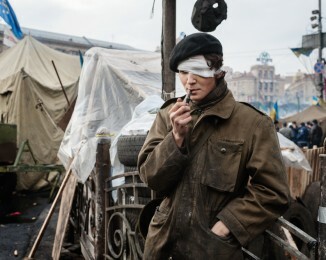 His first trip, however, was not instigated by a job, but rather by an inner necessity to go to Kiev and follow the protests in Maïdan, the main square in the Urkrainian capital: “I feel connected to the Ukraine. 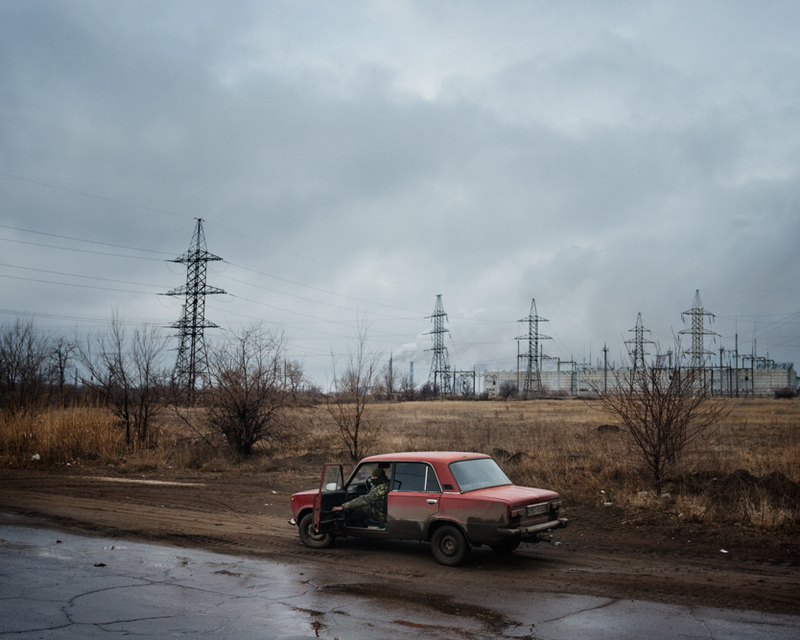 Most of the places that I photographed this year, I somehow knew them from past circumstances.” It began with the Ukrainian President, Viktor Ianoukovytch, rejecting an Association Agreement with the European Union on November 29, 2013. In December, the pacifist movement was limited to Maïdan Square and included political and social claims. In February, the Parliament removed the Ukranian President from office, and the conflict expanded eastward, to Donbass, a region that proclaimed independence last May. 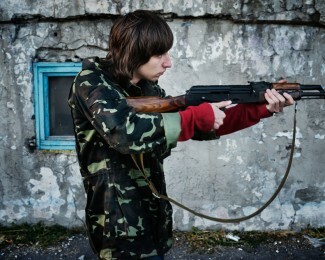 If Guillaume Herbaut left for the Ukraine so quickly, it was also because he follows his instinct. 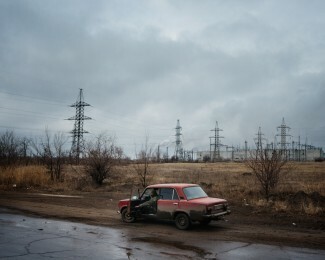 He’s known this country since 2001, when he first went to make a personal series “Tchernobylsty”, about Tchernobyl fifteen years after the nuclear catastrophe. 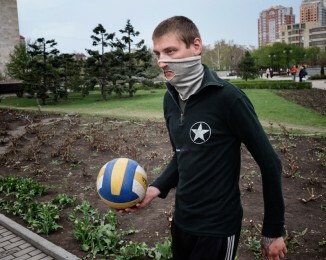 Since, he returns regularly, at least once a year, called by the events that have marked the country, like the Orange Revolution in 2004, or stimulated by personal projects like “The Zone”, which saw the light of day in 2011 in the form of a book, web-documentary, and blog. 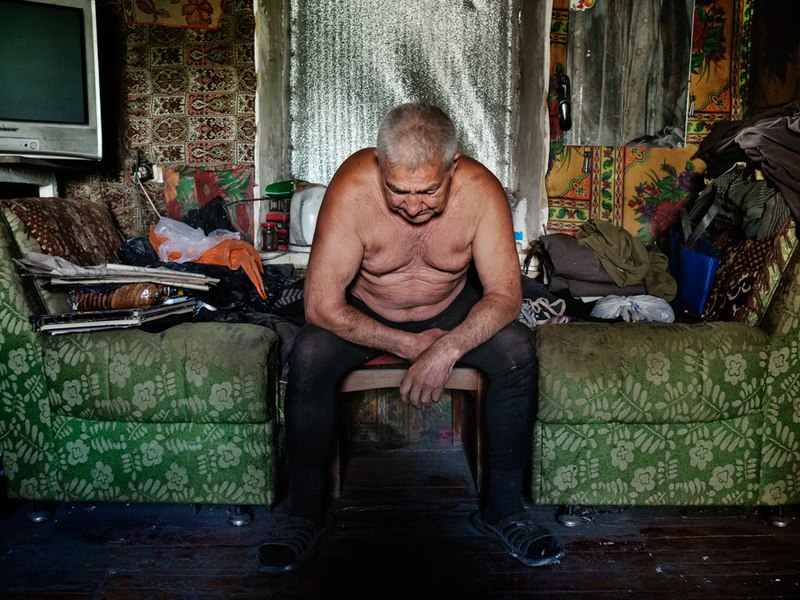 On one hand, his profound understanding of the land, of Ukrainians themselves, and of their history make him a heightened critical witness and observer. On the other hand, this experience represents a turning point for him, the same way Tchernobylsty established a rupture in his photographic style with the transition from black and white into color, the changing of cameras, and a desire to reveal the invisible. Markedly different, today his work is more interested in the present, as opposed to the memory. He follows this “present” constantly, which is rare in his training. Throughout the last six months, he not only went to the Ukraine to cover the facts, but to tell a story – that of the country, conscious of the consequences that this crisis could have on Europe. 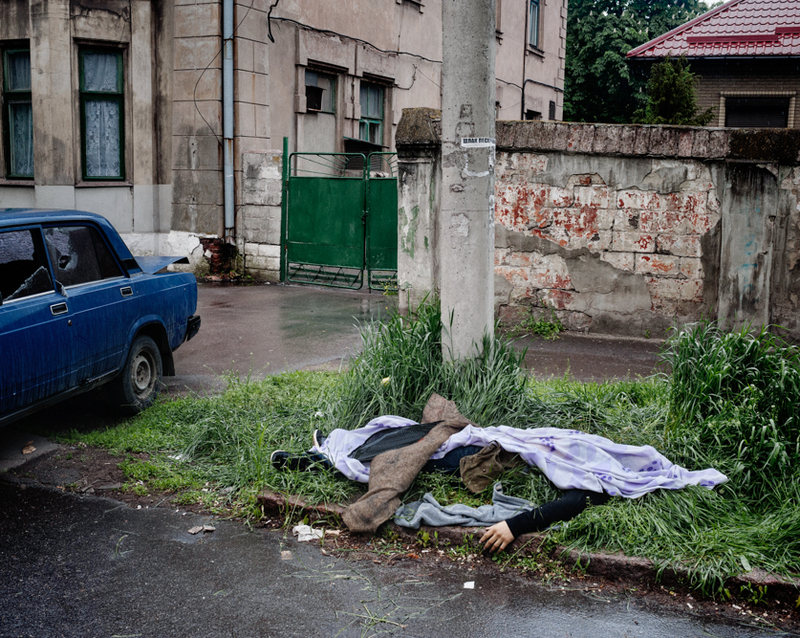 The particular relationship he has with the Ukraine strongly influences his apprehension in the field and directly affects his way of photographing. Thus, since the beginning, he has looked beyond the simple facts and expanded the edges of his field of vision, to what he calls the “outer field”. This specific approach has defined his work for over a decade. 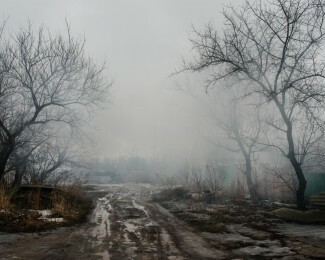 Scenes that can appear anecdotal, with anodyne details, take on symbolic meaning. For the selection presented here, he overcame the constraints connected to photojournalism by putting aside the overly descriptive and chatty images, in favor of his personal point of view. Image after image, the story is sketched: he asserts his intentions. The grouping and sequencing make sense. Chronological, the book rhythmically unfolds like a tale. For Guillaume, it’s about affecting the on-looker, passing on a feeling. With great finesse, he avoids the spectacular effects and the “déjà vu”, and instead invokes limited means, such as eliminating the photos of cadavers. 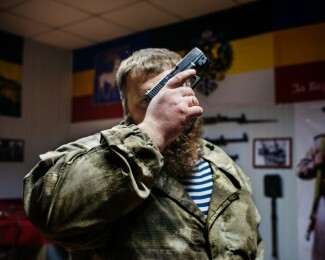 His shots are often large, but this is not at the cost of information because when he takes a step back, it’s to better acquire a certain distance from the facts. In the end, his images are rich in details capable of depicting an ambiance, an atmosphere, which inscribes his work with continuity. Guillaume Herbaut knows how to capture and maintain our attention, in order to oblige us to look, to become aware, and finally to know. This is how his understands his role as a photojournalist and documentary photographer: show the clues from events to render a story. 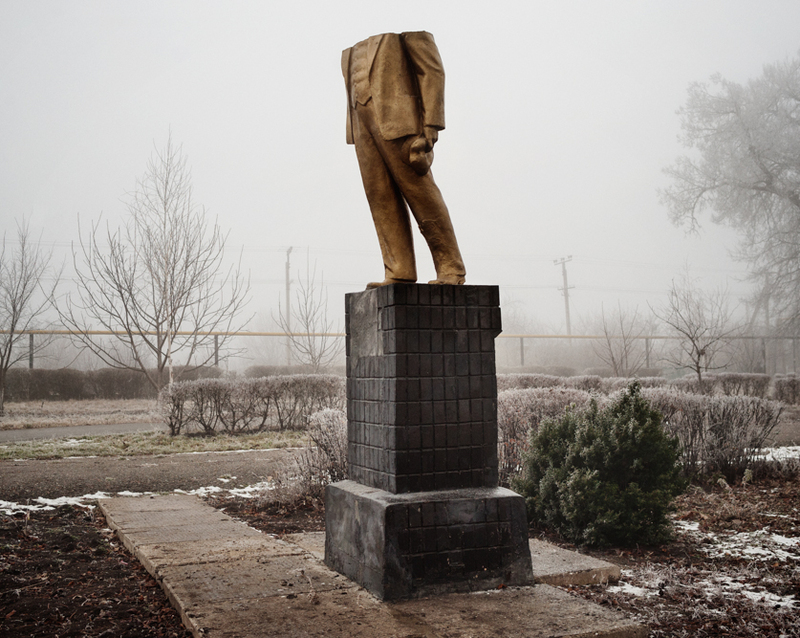 KOTOVSK – CHEMINOTS PARK- DECEMBER 19 2013 – 2:39PM The Lenin statue was destroyed in the night of December 8-9, 2013. KIEV – HRUSHEVSKOHO STREET – JANUARY 22, 2014. 1:59PM Since January 21, violent confrontations take place between law enforcement and pro-EU protestors. The special anti-riot units, the Berkouts, use weapons against the masses. At the end of the day, they count five dead and many hundred wounded. 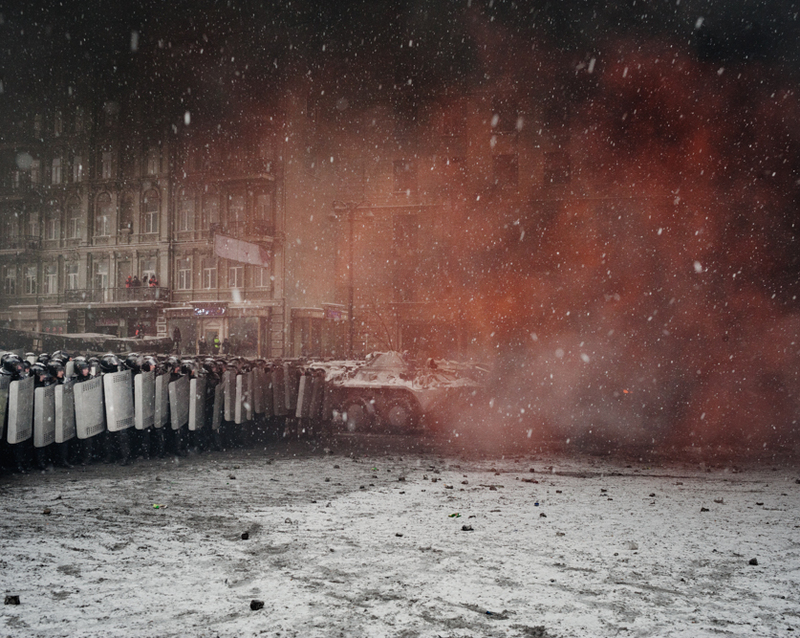 KIEV – HRUSHEVSKOHO STREET – JANUARY 22, 2014. 2:16PM Since January 21, violent confrontations take place between law enforcement and pro-EU protestors. The special anti-riot units, the Berkouts, use weapons against the masses. At the end of the day, they count five dead and many hundred wounded. 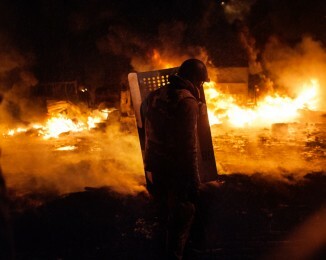 KIEV – HRUSHEVSKOHO STREET – JANUARY 22, 2014. 6:43PM Pro-EU protesters make a wall of fire by burning tires to stop law enforcement from attacking. 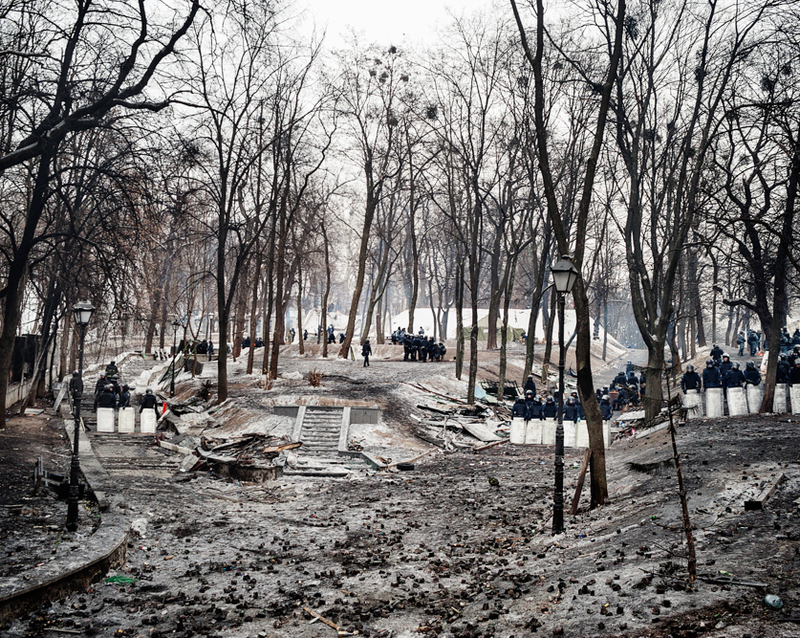 KIEV – PARC DU PARLEMENT – JANUARY 28, 2014. 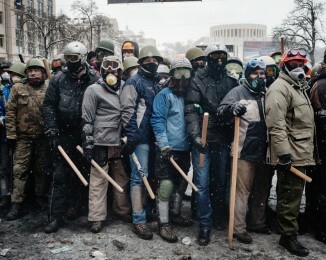 3:55PM Anti-rioting forces face off with pro-EU protesters, outside the Dynamo stadium. 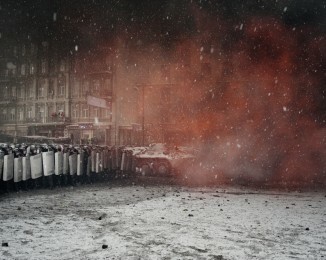 KIEV-MAiDAN SQUARE – FEBRUARY 23, 2014- 2:11PM After the fighting between pro-EU protesters and law enforcement, which resulted in over 100 deaths and nearly 1,000 wounded between February 18-20. 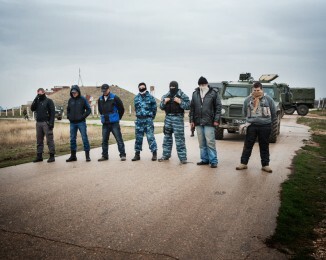 CRIMEA – LUBIMOVKA -MARCH 4, 2014 – 1:52PM Members of the Pro-Russia militia block a column of unarmed Ukrainian soldiers from entering the military airport at Belbek. Russian soldiers have forcefully occupied this airport since February 28th, taking over the region little by little. 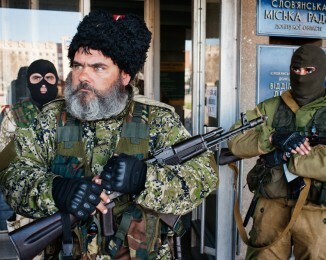 mercenaire, garde lâentreÌe de la mairie de la ville occupeÌe SLAVIANSK -APRIL 15, 2014 -8:41AM A pro-Russian Cossack, suspected of being a mercenary, guards the entrance to the Town Hall, which has recently become occupied by separatist forces demanding independence for the Donbass region. 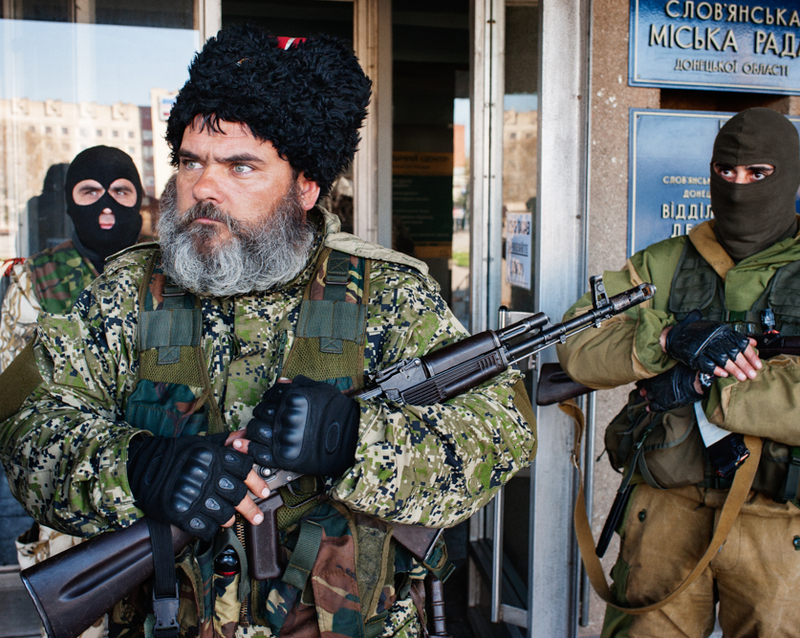 SLAVIANSK – APRIL 16, 2014 -3:17PM With approval from the people, armed pro-Russian men occupy the Town Hall. DONETSK – APRIL 19, 2014 -10:36AM A pro-Russian militant plays soccer in front of the Donetsk Regional State Administration Building. 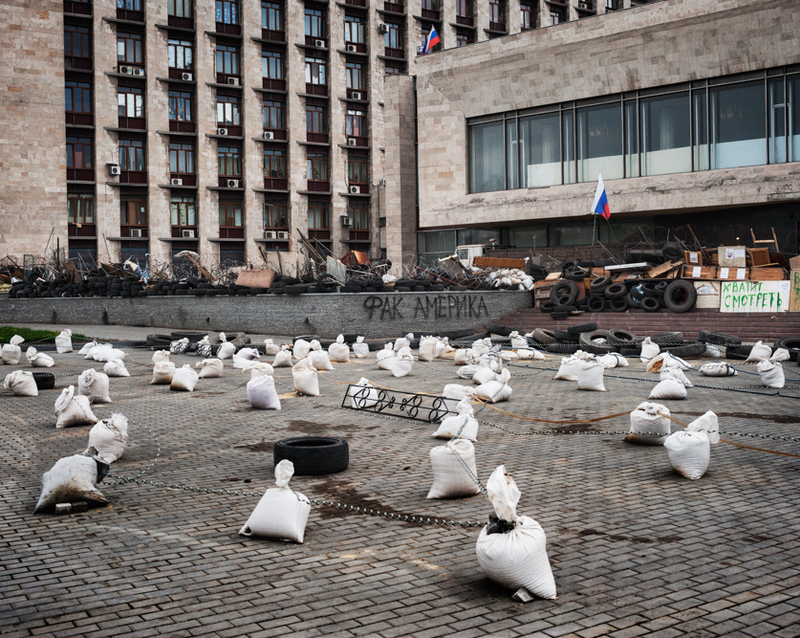 DONETSK – APRIL 19, 2014 – 10:52AM Barricades surround the Regional State Administration Building. 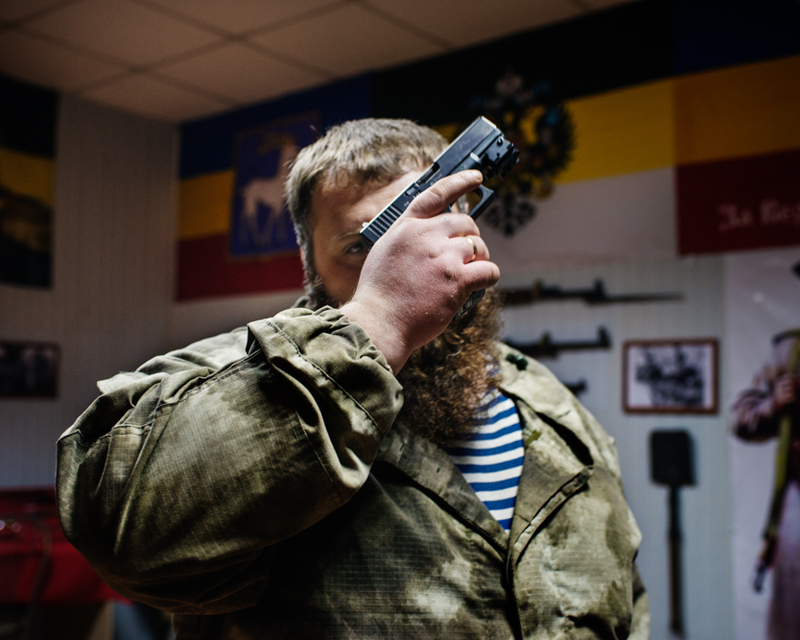 The building, occupied by the separatists, has become the headquarters of the Donbass People’s Republic. 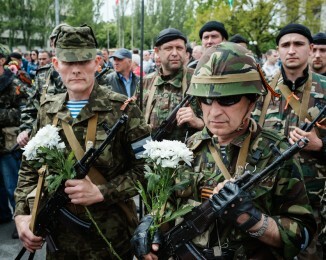 DONETSK – MAY 9, 2014 -11:44AM Members of the Vostok militia parade during a pro-Russian meeting in Lenin Square. MARIUPOL – MAY 9, 2014 – 2:46PM The body of a man lies in front of the police station, following a fight between pro-Russian militia and the National Guard of Ukraine. 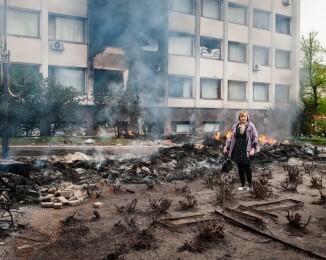 MARIUPOL – MAY 9, 2014 – 3:08PM The Town Hall burns after an intervention from the National Guard to remove the pro-Russian militia, now having occupied the building for several weeks. MARIUPOL – MAY 12, 2014 -12:14PM Site of Mikhael Ermolenkoâ’s tomb, 37 years old. He was a police officer who worked in the IT department. 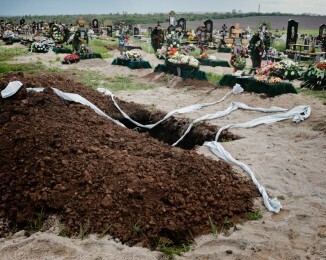 He was killed on May 9, 2014, during a fight between the pro-Russians and the National Guard of Ukraine in the town police station. 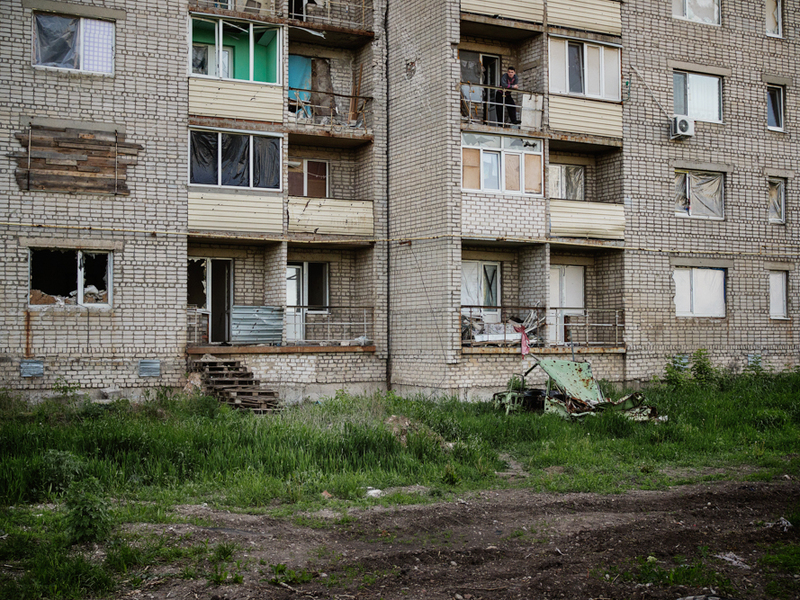 MARIUPOL – Sep 29th 2014 – 2:57PM. Women make a camouflage dress uniform for Snipers inside the office of the Novy Mariupol, an organization that collects equipment for Ukrainian soldiers. 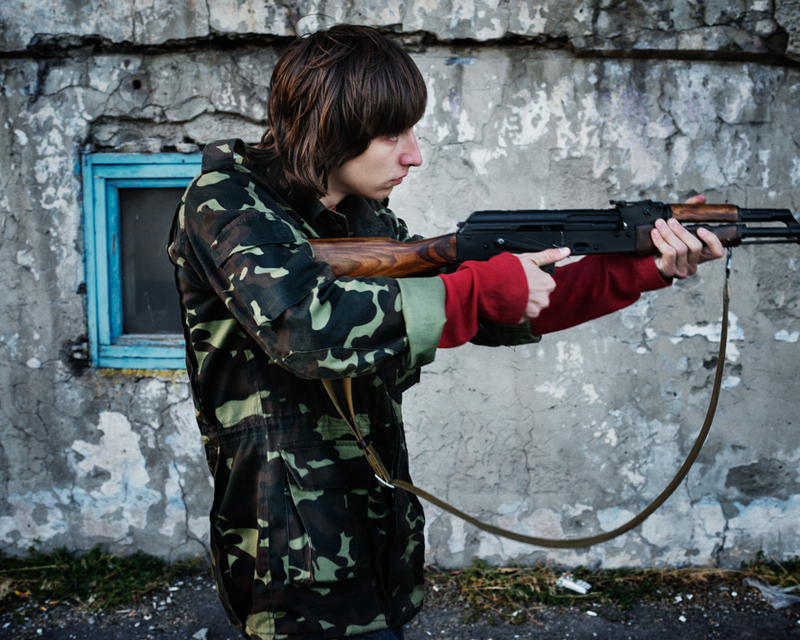 MARIUPOL- Sep 30th 2014 – 5:50PM Mariupol – Military training of Mariupol defenders brigade in an abandoned yachting school. SLOVYANSK- Oct. 1st 2014- 4:53PM- A bridge sabotaged in early June 2014 on the road from Kharkov to Slovyansk during a fighting between pro-Ukrainian and pro-Russian forces to control the Slovyansk city in eas- tern Ukraine. 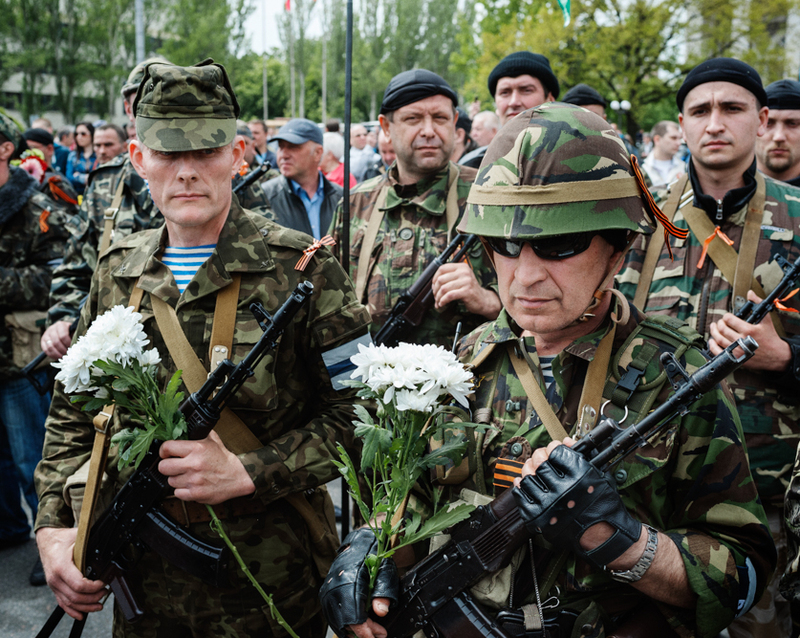 SAVUR-MOHYLA- Oct. 5th 2014 – 4:55 PM-The Savur-Mohyla, a memorial honoring fallen soldiers of the world war 2 battles for the strategic ridgeli- ne, was destroyed. 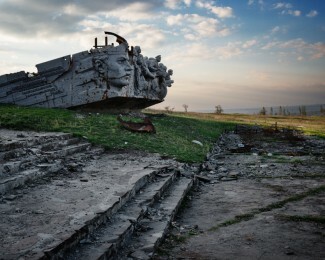 On August 21, 2014, the memorial’s obelisk collapsed after enduring weeks of heavy shelling during pitched battles between the Ukrainian Army and pro-Russian forces. 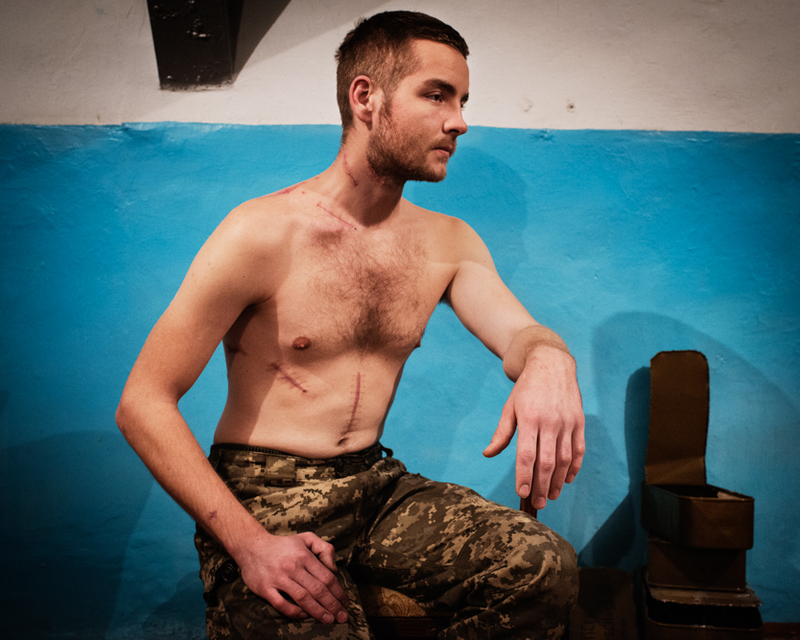 SHASTIA- Donbass- Dec. 13th 2014 -12:00PM- Dimitri Lavrenchuk (26) once in marketing in Kiev now a soldier at the Pro-ukrainian Aidar Battalion, displays his wounds received from an artillery explosion during a battle with pro-russian forces. 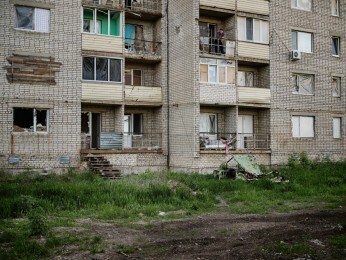 STAROBILSK-DONBASS. December 16 2014 – 3:21PM. 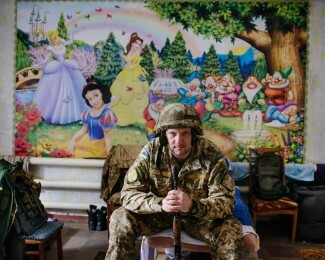 Aidar Battalion Headquarters. 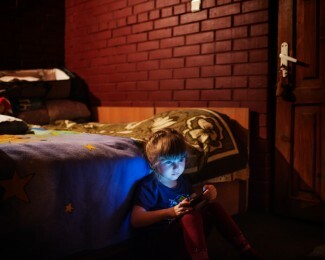 LVIV-February 24th 2015-6:33PM, Aliya, 6, lives with her brother, Alan, and her mother, Suzanna, at the Katerina hotel. 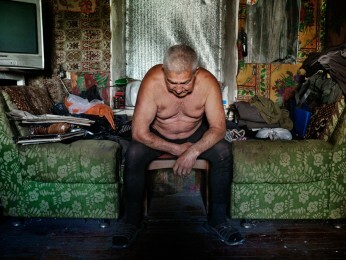 Her family is tatar. 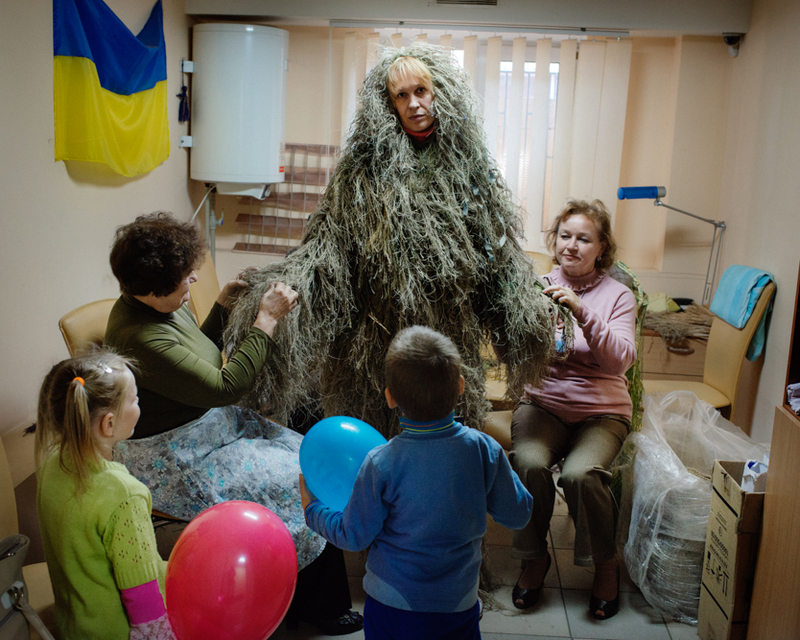 She had to leave Crimea in december 2014 after the russian annexation of the peninsula. 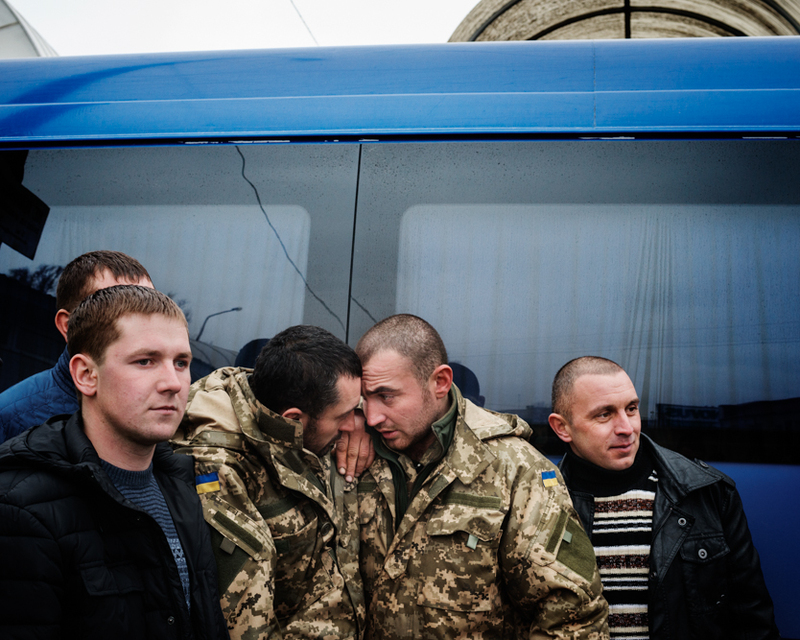 TERNOPIL-February 25th-4:17PM- Ukrainian soldiers say goodbye to each other before joining their families at the bus station after to have spent several months on the front line in the city of Debaltseve in the east of Ukraine. 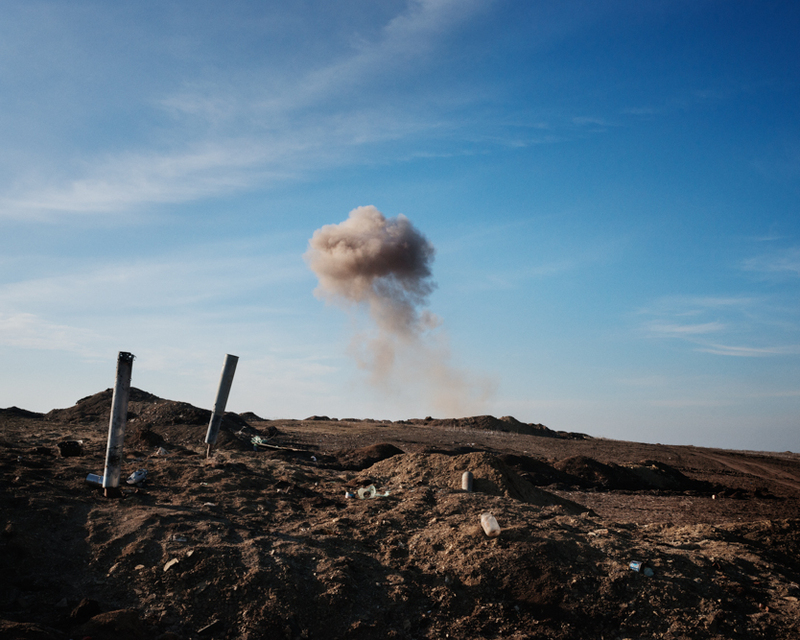 MARIUPOL- March 5th 2015 – 11AM57- A Ukrainian soldier watches over the removal of 3 Grad Multi-Rocket Launcher. 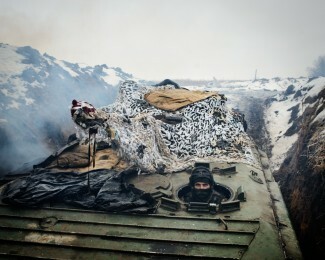 After the Minsk Treaty, as part of the ceasefire agreement the Ukrainian military move their heavy weapons 30 km from the frontlines. 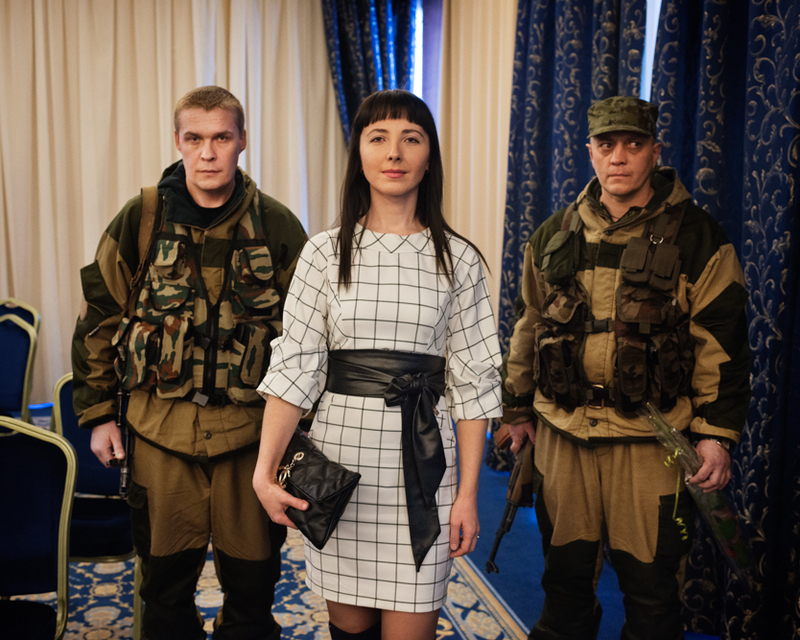 DONETSK – March 7th 2015- 2:38 PM – A wife of an Ataman (Cossack lea- der) of the Don (river) flanked by her bodyguards after the military miss election of the DNR (self-proclaimed Republic of Donetsk) at the Hotel Shakhtar Plaza in Donetsk. 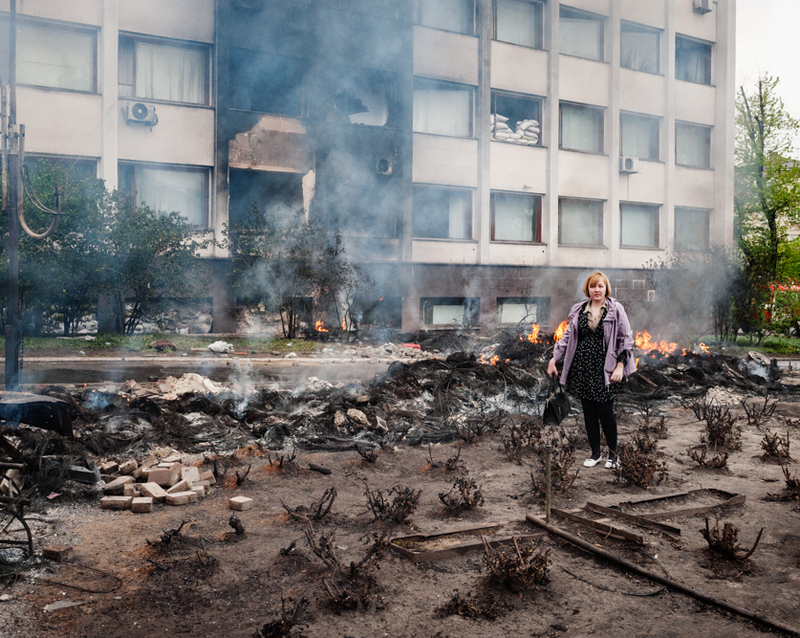 DONETSK-March 8th 2015 – 12:49PM. 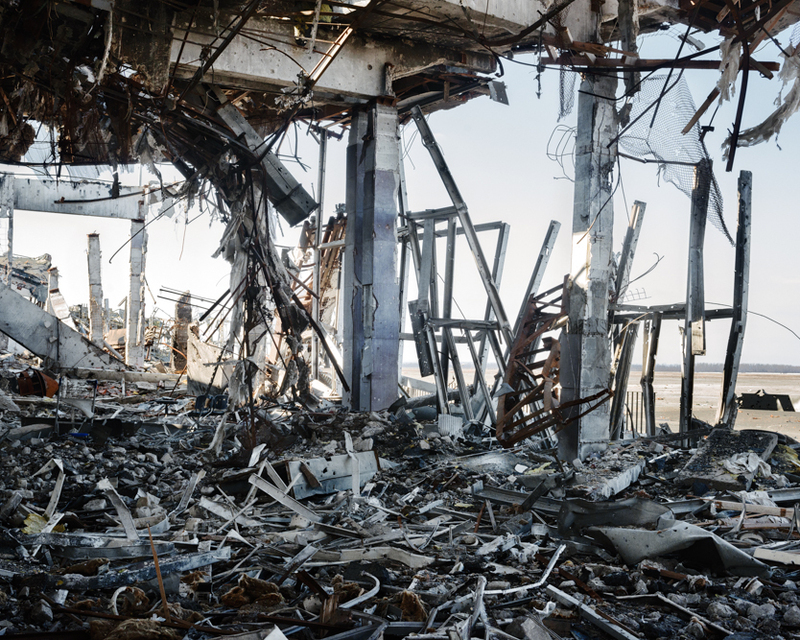 The airport just outside Donetsk, destroyed during fights for its control between the pro-russian and pro- ukrainian forces. 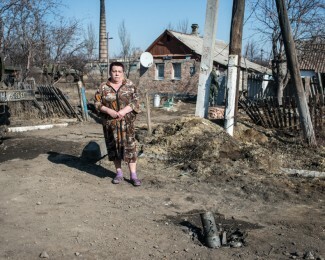 DEBALTSEVE-Donbass-March 9th 2015-13h22 – A woman in front of her house, a few hundred yards away from the town’s former front line where fighting occured betwen the pro-russian forces and the Ukrainian army. 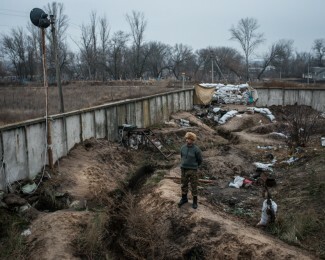 In february, the pro-russian forces had besieged with continuous bombing, althrough the Minsk 2 agreement had just been signed. The Ukrainian army had to surrender the town to the DNR forces. 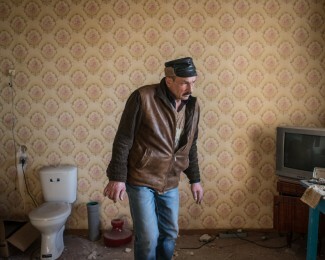 OUGLEGORSK- Donbass-march 10 2015- 15H41 – An inhabitant from the Stankievskogo neighbourhood controls the apartment of his brother in law was evacuated during the fighting beetwen the pro-Russian DNR forces and the Ukranian forces in january 2015. The town of Ouglegorsk was heavily hit by bombings. 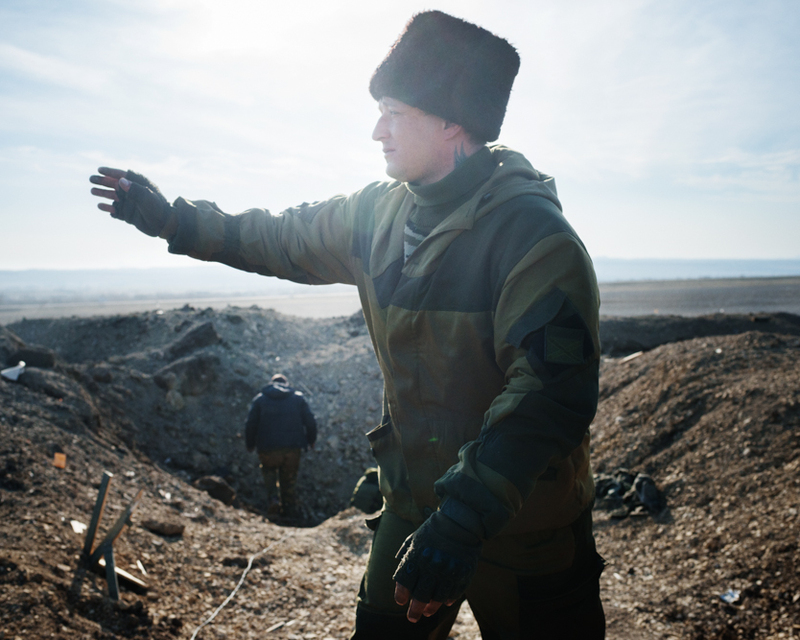 DEBALTSEVE- March 11th 2015 – 15h05 – on a former battlefield in the out- wards , Voron, a russian cossack and his team are defusing the bombs in the aera where the pro-Russians and the pro-Ukrainians fought in january 2015. 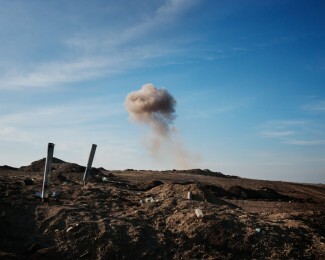 DEBALTSEVE- March 11th 2015-15:26PM-Explosion of shells by a DNR (The Donetsk People’s Republic) bomb-disposal Unit on a battlefield around the city. 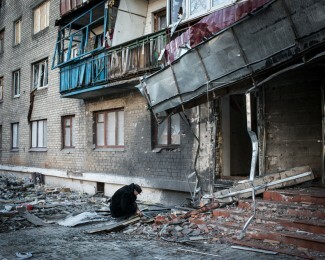 DEBALTSEVE-March 11th 2015- 4:02PM-Alexi Stipanovich, 76 years old, in front of his building destroyed during the shelling of Debaltseve. 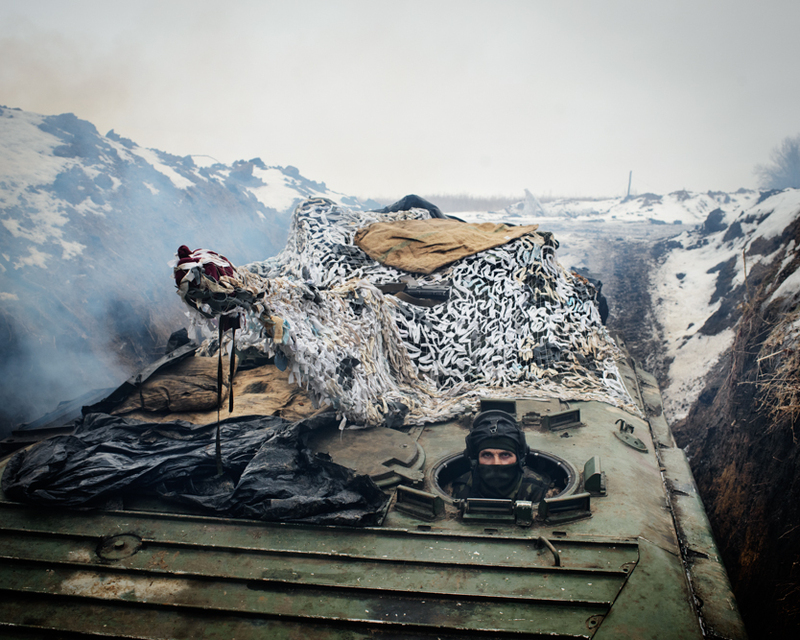 KRIMSKOYE- February 6th 2017-1:48 PM- Military position of the 93rd brigade of the Ukrainian army. 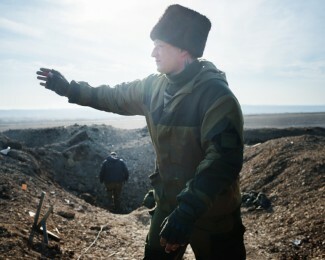 At 1000 meters are the 1st pro-Russian lines. AVDIIVKA- February 24th 2017-13: 44 Volodymyr, 38, press officer of the Ukrainian army poses in the dormitory of the military press office of the 72nd Regiment located in an old crèche. AVDIIVKA- February 25th 2017-10: 43 AM Chernichevskogo street in the old town of Avdiivka smoked by the fire of a house affected by bombing during the night of 24 to 25 February 2017. 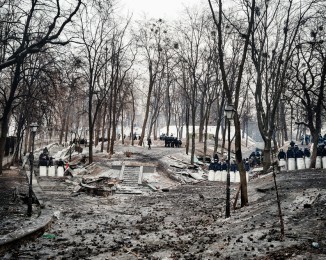 The front line is 300 meters at the end of the street. 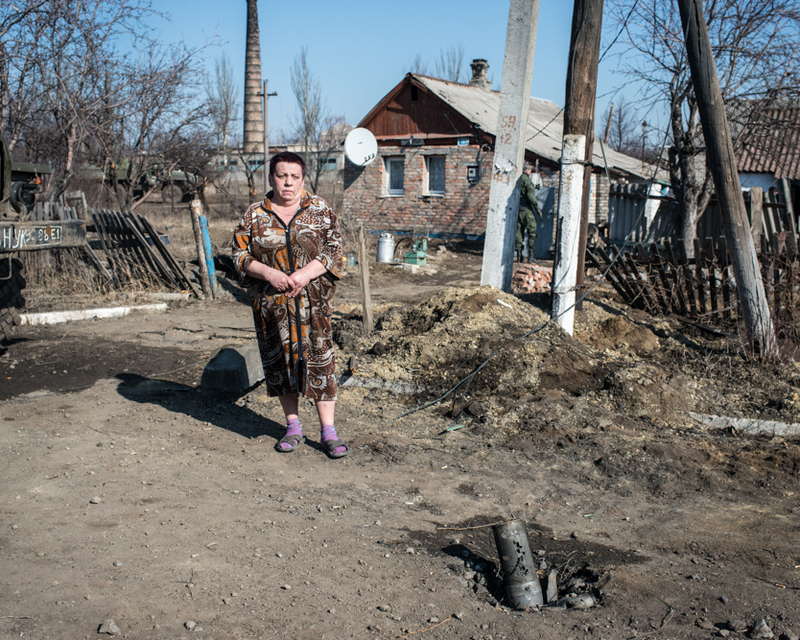 AVDIIVKA- 79 Lermontova Street-May 24th 2017- 4H42 PM Alexander Ivanovich, 65 years old. 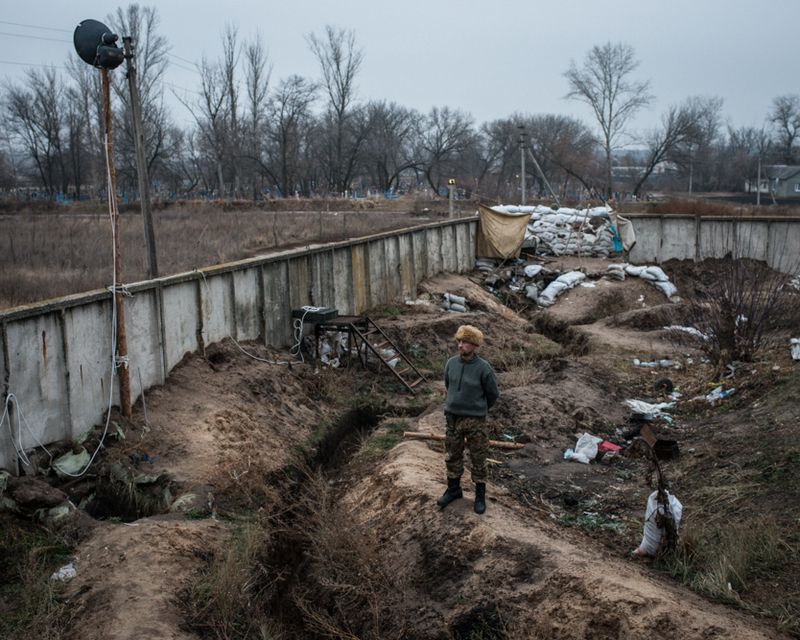 His house, which was hit five times by shellings, is located at a few hundred meters from the front line of the Ukrainian army. 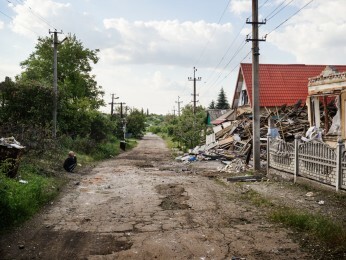 AVDIIVKA – Lermontova Street-May 24th, 2017- 5:27 PM A man looks at his neighbor’s house destroyed the day before by shelling in the old town of Avdiivka. 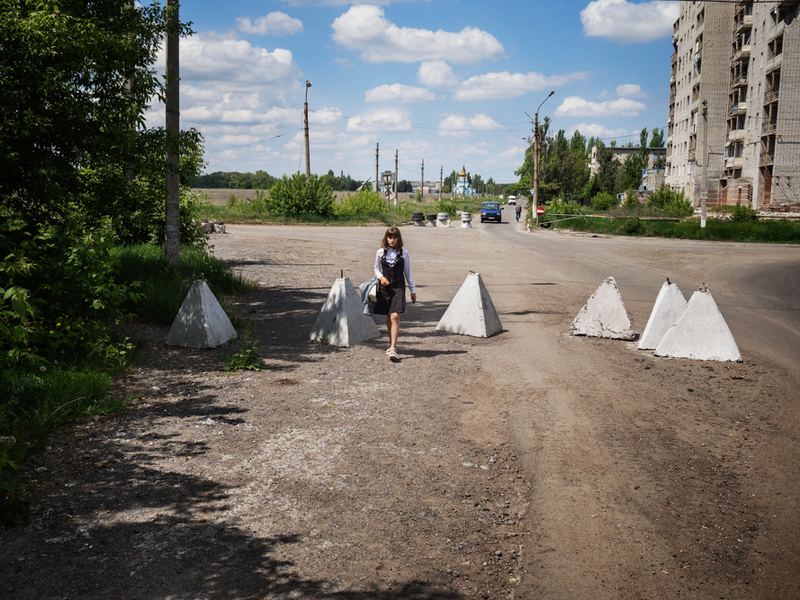 AVDIIVKA- May 26th, 2017-10: 55 AM A schoolgirl returns to her neighborhood of the old town of Avdiivka passing by a Ukrainian military checkpoint located a few hundred meters from the front line. 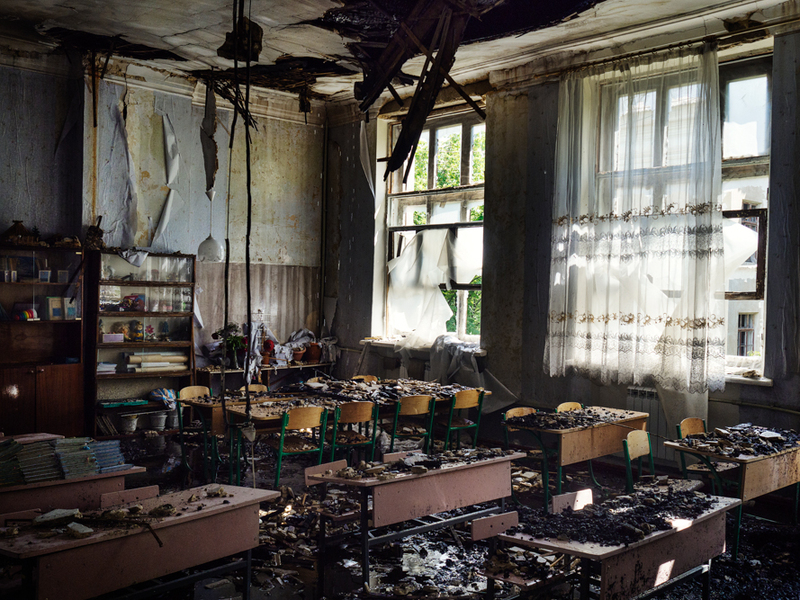 KRASNOHORIVKA- May 28th 2017-1H33 PM A class of the school N°2 a few hours after being hit by a Grad the same morning between 6:40 and 7:40. 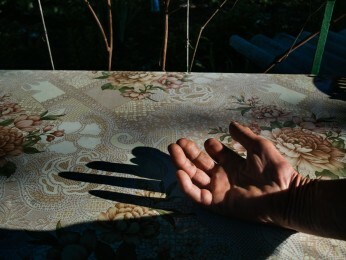 MARINKA- May 28, 2017- 5H38 PM The hand of Vladimir Nilolayevich, 62, wounded on February 15th 2015 in his garden by the explosion of a shell. He lives in the street Prokofiev formerly Lenin street. The street is located in the front line.